Uber is closing its autonomous truck driving company, Otto, just two years after paying nearly $700 million for the company. According to an NPR report, Uber also spent nearly $925 million on autonomous freight trucks in the hope of revolutionizing the trucking industry. Uber’s autonomous division will focus exclusively on self-driving cars. Part of the reason for the closure of the self-driving truck line is the cost and concerns of Uber’s settlement with Waymo regarding intellectual property. Self-trucking companies offer the promise of drivers who won’t drive while distracted and drivers who won’t be intoxicated. These safety benefits are countered by many concerns about how well the software and hardware will work on a daily basis and in emergency situations. Truck accidents can easily happen if the trucks aren’t safe. Otto was started by several Waymo employees. (Waymo is a Google spinoff.) Waymo asserted that a co-founder, Anthony Levandowski, of Otto had “raided Waymo’s design server.” Mr. Levandowski ceased working for Uber after the intellectual dispute over trade secrets began. As part of the settlement, Uber contracted to give Waymo a large amount of stock in its car service business. Uber will continue to build and improve its LiDAR technology which uses lasers to create a virtual view of traffic for self-driving vehicles. Uber also will continue to build its freight company by matching shipping companies with truck drivers. The company is also continuing with its self-driving car tests on public roads. Uber had suspended its public tests in several US and Canadian locations after a woman was killed in an Arizona self-driving accident. 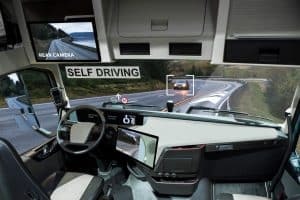 While Uber may not be in the self-driving truck business anymore – for which we breathe a sigh of relief; autonomous trucks still make us a bit nervous – that doesn’t mean Uber has given up on the commercial trucking industry entirely. According to the NPR piece, the company is looking to expand its Uber Freight business, where it pairs up truck drivers with shippers. Uber claims that it will “maintain insurance while a rider is in the car above what is purchased by the driver, when necessary,” but the partnership only exists in certain cities, which leaves us wondering if that “additional” coverage will be enough in the event of a collision. At the Rocky McElhaney Law Firm, our Gladiators in Suits fight for serious injury victims who have been hurt as a result of the negligence of a person or company. Our Nashville truck accident lawyers have a track record of success for our clients. We have the resources and experience to help you get justice. For help now, please phone us at 615-246-5549 or use our contact form to schedule a free consultation at our offices in Nashville, Hendersonville, and Knoxville.